History | Montreal Irish Memorial Park Foundation, Inc. In 1847-8, Montreal was growing and progressing. During the terrible event of the Irish Immigrants, a number of other things were happening as the city grew and prospered…. 1847 – The Montreal Telegraph Company founded. In 1850, the year prior to Hugh Allan's presidency, Montreal Telegraph Co operated merely 500 miles of line, all in the province of Canada. 1847 – Telegraph service between Montréal and Toronto, between Montréal and Quebec City, and between Montréal and New York City established. 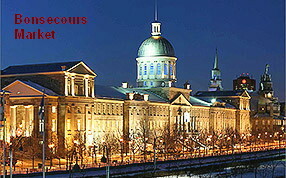 1847 – Bonsecours Market opened. It housed City Hall between 1852 and 1878. 1847 – The first Bonaventure Station is built on Saint Jacques Street as the main terminal for railway from Montreal to Lachine. 1847 – The railway from Montreal to Lachine is opened. 1847 – Desbarats & Derbyshire (Georges-Édouard Desbarats and Stewart Derbyshire) start a glass factory at Vaudreuil. 1847 – January 30 – Lord Elgin, Governor, arrives at Montreal. 1847 – The first mass is celebrated in St. Patrick's Basilica on St. Patrick's Day, March 17. 1847 – September 1 – Lord Elgin visits the fever sheds at Windmill Point. 1847 – October 23 – 65 immigrants die in a week at Windmill Point. 1847 – November 1–9, 634 deaths of immigrants since January 1. 1847 – Bank of Montreal Head Office, Montreal built. 1847 – Arrival of Brother of Saint-Viateur in Montreal. 1847 – Formation of the Montreal Society of Artists. 1847-48 – In all, between 3,500 and 6,000 Irish immigrants die of the Typhus epidemic of 1847 at Windmill Point. 1848 – January 2 – Wellington and Commissioners streets flooded. 1848 – June – Emulating the "Lord Sydenham's" success in 1838, several steamboats run the Lachine Rapids. 1848 – July 5 – Run on the Savings Bank, Montreal, followed by re-deposit. The 6000 Irish victims of Black 47 were buried over a wide area, often simply in quickly dug trenches. Of course, the shoreline around the area has changed a great deal between 1847 and today. As a result, the exact location of these graves is difficult to determine & bones of victims are still occasionally found. The last major reburial of some found bones seems to have been in 1942, almost exactly 100 years after the event. This article from the Gazette, October 31st 1942 notes the ceremony that took place at that time.